To pass the time, I took a picture of my armrest, because nothing else had happened during the day that was post-worthy, and there wasn’t a lot of daylight left. $3 – which I had just spent on my dinner, not having enough cash on me. Candles and matches for when I am stuck on the side of the road, or if I want some nice ambiance while driving. Keychain bottle opener and screwdriver. Huh, looking over that list, I think I’m prepared for a fancy dinner on the beach. I don’t see any dust or dirt AND you have everything arranged so nicely! 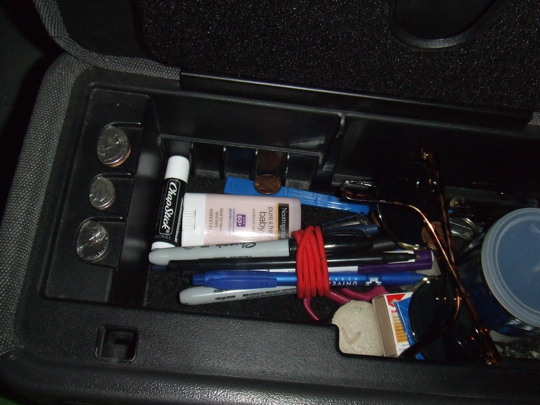 My inventory: car-phone charger, tissues, a phone book. Not even any candy. I need to fix that. Non-chicken sausage nuggets at McDonalds? Why don’t they offer those in Chicago? Are they any good?